Posh star Marcus Maddison takes on Crewe's Harry Davis. Photo: Joe Dent/theposh.com. Peterborough United made it three League One wins in succession today (April 2), but manager Graham Westley insists his side are capable of so much more. Two goals from in-form midfielder Harry Beautyman and another from striker Lee Angol sealed a comfortable 3-0 success over rock-bottom Crewe at the ABAX Stadium. Posh striker Lee Angol (left) celebrates his goal against Crewe with the man who set it up, Marcus Maddison. Photo: Joe Dent/theposh.com. Not that Westley was overly impressed. He reckoned his side made hard work of beating a side who look doomed to League Two football next season. Westley said; “It’s three goals, three points and job done, but we made it much harder than it needed to be. “We were counter-attacking at home in the first-half against the team at the bottom of the league and that certainly wasn’t the gameplan. “That happened because our tempo in possession wasn’t good enough and our work ethic off the ball wasn’t sufficient. We are capable of so much better. Harry Beautyman is about to tuck in his second goal for Posh against Crewe. Photo: Joe Dent/theposh.com. “We can’t argue with the result because we deserved to win the game and we won convincingly, but there are other factors to consider especially with next season in mind. “We have to realise we have a great responsibility to our fans. Our job is to give them 90 minutes of attacking football and great entertainment. “I don’t want our fans to wander home after a game and to be talking about the odd moment of excitement. I want them to leave thrilled with 90-minute performances from their team. 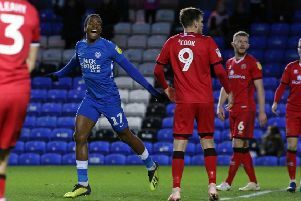 Posh have now scored 68 goals in their 39 League One matches, but they are now ‘only’ the second-highest scorers in the division behind Wigan who went top of the table with a 5-1 hammering of Shrewsbury today. But Posh have players in great attacking form, notably Beautyman who has scored three goals in his last two matches, and Marcus Maddison who created two goals today to make it a superb 15 assists for the season. Westley added: “Harry Beautyman has started to do what he is very good at. Players always need to work out what they do best and in Harry’s case that’s getting around the pitch, harrassing opponents and getting into the penalty area. “Today he picked up no end of second balls, he tidied up possession and he scored twice. You can’t ask a lot more from a midfielder. “And Marcus is just relentless at the moment. If you get the ball to Marcus he will create and score goals, At the moment he is attracting the ball and making things happen. “The third goal today said everything about Marcus. He showed great vision and then great execution to hit the perfect pass to Lee Angol. “We’re in good form now. That’s three wins in a row and we want to extend it further. “When we were struggling we knew what the problem was, We were trying to integrate a lot of new players, some of whom hadn’t played League One football before, we lost Conor Washington and we had injuries and suspensions to key players. “We were on a very rocky road for a while, but we stuck together, retained our self-belief and we we worked really hard to get our form back. Centre-back Gaby Zakuani wasn’t considered for selection today after playing two full competitive international games for DR Congo last week. He will be back in contention for Tuesday’s (April 5) League One trip to Fleetwood when a win would take Posh into the top half of the table. Westley confirmed he withdrew left-back Andrew Fox early in the second-half as he believed the player was a foul away from a red card. Midfielder Simon Gillett’s initial month on loan at Posh has now expired. Westley will discuss the player’s future with parent club Yeovil early next week.